Review by Melodie M. Davis, class of 1975. 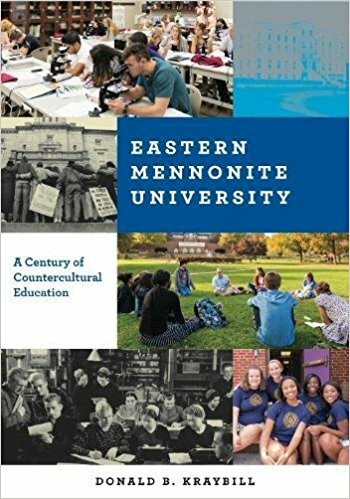 Last week I introduced some of the things I liked about Don Kraybill’s 100 year history of my alma mater, Eastern Mennonite University: A Century of Countercultural Education. I had never known that an early attempt at starting an eastern Mennonite school was first located in Alexandria, near Washington, D.C., within a mile or two of the Mt. Vernon home of George Washington, the first U.S. president. Of course the early Bible-focused short semester was two centuries after George, but how different EMU would be today had it been located in the metropolis surrounding our nation’s capital. My sister, a Goshen College student at the time (and later a faculty member) used to tease me that students wore capes and coverings at Eastern Mennonite. By the time I got there, not true, but if you are an alum of either Goshen or Eastern Mennonite, you need to check out the intense rivalry and rancor that existed between the two schools, not because of dress, sports or academics per se, but theology—almost to the point of splitting families and friendships. J.B. Smith, EMC’s first president, just four months after he became president, implored the Mennonite Board of Education to “drive out the enemy,” (the liberalism that he blamed Goshen College for spreading across the church). How Smith came to be president early on when founders were desperately seeking one, and then resigned under pressure, is another surprising story in itself. Although EMC turned away the first several African American students who wanted to attend (fearing the local community wouldn’t be happy about it), they later broke color barriers at a time when people in Virginia (the old South) weren’t very much inclined that way. In 1971, I was matched with an African American roommate, 23 years after the first black student was admitted to EMU. Paula and I had a good Freshman year and I learned much about her culture while she became acquainted with Mennonites, after bravely coming to a campus she had never set foot on, among Mennonites she had never heard of. I found another whole definition of “millennials” than what we use today, as Kraybill sorts out the many theological battles of the first half of the 20th century fundamentalists over premillennialism, amillennialism, and millennialism. The current (2017) enrollment of actual Mennonites in this long time Mennonite institution was only about 31 percent, which creates a very different campus environment than what existed in the 20th My roommate would find an entirely different campus today, but sad to say we’ve lost touch. An eccentric professor who was an inventor and believed firmly in UFOs, E.G. Gehman. Gehman was someone I picked to interview for a feature writing assignment. His second wife was a loyal and longtime volunteer for may local Mennonite agencies, including ours, Mennonite Media. Some of Gehman’s “political” cartoons (about EMU/Goshen conflicts and the fight over dispensationalism) are included in the history book. Nobel Peace Prize winner Leymah Gbowee (and an EMU grad school aluma) visited campus in 2011, author of a marvelous read, Mighty be the Powers; I was pleased to attend her press conference and meet her afterwards. Mary Emma Showalter, the first woman on the faculty to earn a doctorate, (although I was not on campus at any time when she was) compiled the bestselling Mennonite Community Cookbook published in 1950. Years later I got to research and write a 65th anniversary retrospective on the book (which is now published in the back of that historic cookbook). Can I be secretly proud and remain Mennonite-humble? One of my roommates my senior year of college, Sara Wenger Shenk, who now serves as president of Anabaptist Biblical Seminary, is the granddaughter of, A.D. Wenger, the second president of EMU. It blew me away that her grandpa grew up only 4-5 miles from where I live today. He lived near a village called Greenmount. (I didn’t know it ever was a village, although one old storefront still stands from that time). After losing his first wife to illness just a year after their wedding, out of grief and loneliness he decided to travel all the way around the world, perhaps the first Mennonite to do so, which became a launching pad for a remarkable preaching career and eventual invitation to be president of the college. Later I would infuriate the dean of the seminary, George R. Brunk II over an ill-conceived stream-of-consciousness description of Eastern Mennonite Seminary (mostly male at the time) in the EMU Shen (yearbook). Years later I apologized and received his gracious forgiveness, to keep peace with the man whose preaching once inspired me to walk the literal sawdust trail of a large tent revival meeting. I found the second half of the book fascinating as well, although in not as personal of sense, because while I worked 42 years next door to the EMU campus and walked the grounds (or the indoor track) almost daily for exercise, I was not as involved with the daily and yearly workings and issues of the university. For anyone interested in Mennonite cultural history and understanding some of the early dilemmas that were just as heated (maybe more so) as today’s divisive issues, this book brings, intellectual intrigue, delicious detail, inspiring insight, and admirable analysis. Interesting article, Melodie! I enjoyed reading about it. Yes, you can still be proud and humble at the same time over your cookbook accomplishment. Last week I just read in Ecclesiastes 3:12-13 — that everyone should “take pleasure in all his toil—this is God’s gift to man.” I think this counts as taking pleasure in your toil. Dispensationalism – Now there’s a word I don’t hear too often! It brings up memories of deep conversations with my dad. Nice to hear from a new commenter here and after visiting your blog, I can see why it appealed with your themes of cherishing the past, celebrating the present. How apt for this particular book review. Amen–regarding words like dispensationalism. I don’t think I will ever keep the various forms of that word straight in my head. But today will remember your reminder to “take pleasure in my toil.” Thanks for all! I do not think of Mennonite Culture as ‘counter culture’, but I suppose it is about as ‘counter’ to ‘culture’ as it gets. It is unfortunate that those who are not familiar with it are not interested in it. So much of what is standard to Mennonite Culture is what so many other cultures strive for and want to make trendy. I notice it in horticulture. The philosophies of the Mennonites still work, while everyone else is trying to find new fads and trends to accomplish what the Mennonites have been doing for a very long time. Okay, I will not go into that rant again! Rant away! Love your perspectives here and of course there are many different Mennonite “cultures” and types of Mennonites. Not sure how familiar you are with Mennos and I won’t go into here either. (Plenty of info out there but http://www.thirdway.com is a website I help to curate for my main job at MennoMedia.) But for sure many are searching for the peace and simplicity they think there is among certain groups of Mennonites (or the strain of faith known as Anabaptists coming out of the Reformation). Enough. There is truth in your comment and thanks for showing up here!